(Victor Valley)— Boom! 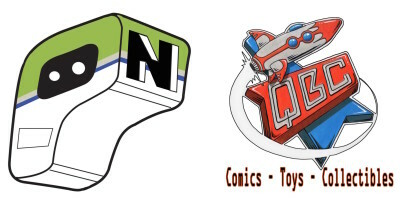 Studios and their Archaia imprint has been known for brining amazingly high quality, foreign projects to the United States. With Mezolith, we are treated to a world 10,000 years ago, in a world of full of danger, mysticism and above all, finding one’s path in life. From writer Ben Haggarty and artist Adam Brockbank, this hardcover collection brings the award winning British graphic novel stateside, and does so in grand fashion. For anyone not familiar with Archaia and the high level of quality the hardcovers they produce are- let me say, no one delivers a better hardcover graphic novel on the market than Boom/Archaia. A sturdy collection with a knockout design flow to it, this is a book that will look great on any bookshelf, even if you didn’t read it. But why would you not read such a well-done book? The book takes place 10,000 years back, of the eastern shores of Stone Age Britain, and focuses on the Kansa tribe, and more noteably, the young boy Poika, who is eager to prove himself a man- a man capable of hunting, foraging and caring for his people. Composed of short chapters that follow the young man, we see the struggles he goes through- from a near death situation that has some mystic intervention, to battling everything from beings of lore to warring tribes- Poika struggles to belong in a tribe full of strong, seasoned hunters. Haggarty’s tale is one of life lessons and mythology- weaved and intertwined to make a story both real and surreal. Taking a primitive setting, filled with animalistic dangers, and grounding those struggles we as humans go through today- like crossing rites of passage, confrontations with tragedy, and how our true selves shine through in the face of adversity. Brockbank’s artwork is breathtaking, and he creates a lush and detailed look into the stone age. From his depictions of man, to the animals being hunted, the demonic threats that make themselves known, to the swan maiden myths, which look so fantastical- this book is a feast for the eyes. By the end of the book, we see the fate of young Poika, and we are definitely left wanting more. Luckily, there is an ad in the book announcing volume 2. 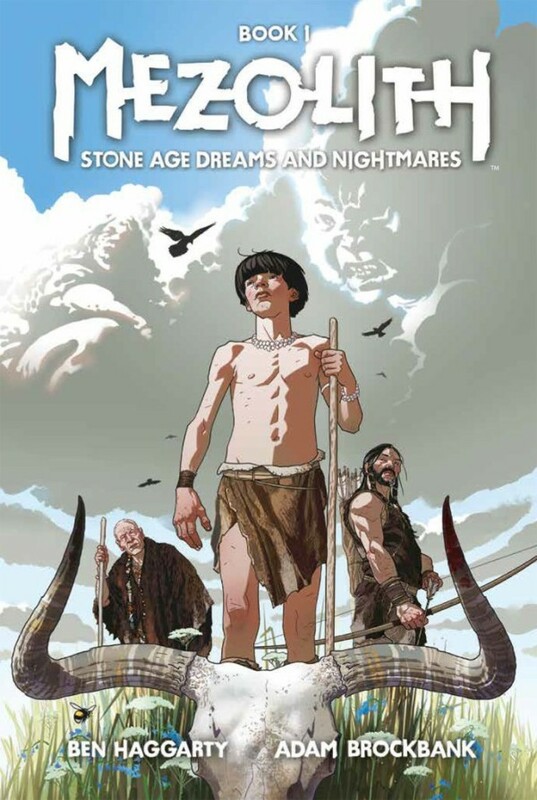 Mezolith Volume 1 is an exciting romp though the stone age, and the journey from a boy to manhood. This is easily one of the most unique and one of the must-read books so far for 2016.